The Lagos State Governor, Mr Akinwunmi Ambode, is grieved by the death of those who lost their lives to the tanker explosion that occurred along the Lagos-Ibadan Expressway on Thursday. He offered his condolences to the families of the deceased in a statement on Friday by his Chief Press Secretary, Mr Habib Aruna. Governor Ambode, however, said he was consoled that the number of lives saved was more than those who died, as a result of the quick response by emergency agencies. He urged the people of the state to always give access to emergency responders during such incidents, to prevent avoidable loss of lives and property. “I want to commiserate with all the families of those that have lost their lives. We never wish for incidents like this but again we take solace in the fact that we were able to save more lives,” the governor said when he visited the scene of the incident yesterday. 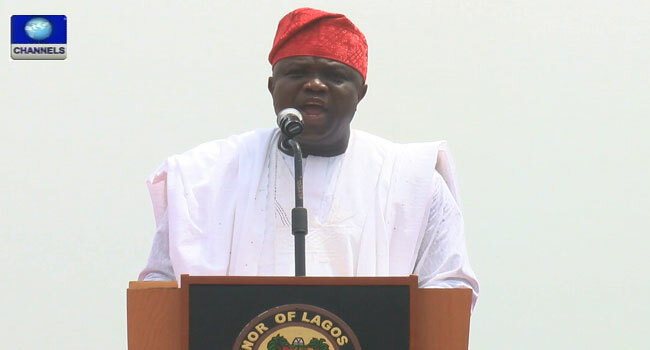 “I also want to appeal to Lagosians that we don’t like to see onlookers; there is a need to always give way for our first responders and all our agencies to save lives quickly and that is the whole essence of having the Response Unit,” he added. Ambode thanked the people for their patience and assured them that the state government would continue to put measures in place to mitigate such incidents in future. Although more than 50 vehicles were burnt in the accident, he commended the response time from officials which he said was less than three minutes. The governor said, “I want to praise all our agencies – the Fire Service, the Rapid Response Squad (RRS) and also the Lagos State Emergency Management Agency (LASEMA) Response Unit; this is what we have been saying about investing in some of these infrastructure and equipment.